For the past four days, Gotham has been cloudy and rainy. It feels much more like October than August, but considering that most of July felt akin to being trapped in Hell’s basement, particularly while being broiled alive on the subway platform, I’m not complaining. Well, not complaining much. My hair does look like a big brown cloud, and I am not too thrilled about that. 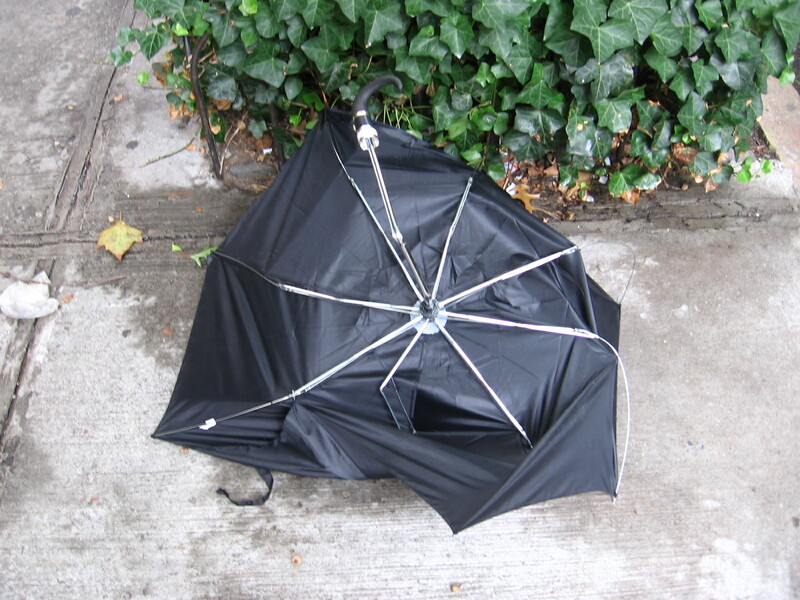 Pictured below are the crippled remains of an umbrella; an umbrella that was very likely purchased by some drenched sap or sapette for around five dollars from a New York City rainstorm institution, The Umbrella Man. I’ve lived in New York so long, I remember when these guys used to charge three dollars. Since I am almost always equipped with my own umbrella, I have two turbocharged models that might have been manufactured by Maserati for they almost pull my arm out of its socket when I press the button that opens them, it’s possible that The Umbrella Man might be charging six dollars or more by now. One thing that I am certain of is that the quality of The Umbrella Man’s umbrellas remains trash can worthy, and that’s the likely destination of the vast majority that are not ditched in the street like the one pictured above. Almost as soon as you open one of The Umbrella Man’s umbrellas, if there is as much as a Chihuahua’s sneeze in the air, it will instantly blow inside out, so you can imagine how sturdy they are under gale force wind. It has occurred to me that these umbrellas might blow inside out if opened under a sunny blue sky, simply because there is an umbrella industry conspiracy in play here. The conspiracy is that The Umbrella Man’s umbrellas are purposely designed to blow inside out to ensure that customers will either buy more umbrellas from The Umbrella Man, which could be another definition of insanity, or just before these users commit themselves to a mental institution, these same customers – people like me – break down and invest the equivalent of a one way plane fare to New Orleans on JetBlue in a top of the line umbrella instead. Also, if I were inclined to visit New Orleans this time of year, it would probably behoove me to pack my performance-enhanced umbrella. Returning to the subject of the defective nature of The Umbrella Man’s wares, the handles tend to be wobbly and the little round piece at the top holding the entire apparatus together has been known to fall off, especially if you’re like me and bought one that said Totes. That batch of The Umbrella Man’s umbrellas was probably manufactured in the same third world sweat shop that produces knock off Coach and Louis Vuitton handbags. If the user of an umbrella purchased from The Umbrella Man is able to get three uses out of it, that user is qualified to be ABC News’s Geek of the Week, and/or they should make a guest appearance on The Late Show with David Letterman to discuss this phenomenon, for it simply does not happen.